The Golden State is about to get one hell of a solar boost, as Secretary of the Interior Ken Salazar just gave the green light for the construction of the Desert Sunlight Solar Farm – a 550 megawatt solar power project that will be built in the California desert east of Palm Springs. The photovoltaic solar facility will generate enough energy to power 165,000 homes while bolstering the local economy by creating more than 630 jobs during its construction. The plant will use state-of-the-art ultra-thin photovoltaic (PV) technology to generate electricity with low visual impact and no air emissions, waste production or water use. In fact, it is expected to have the smallest carbon footprint of any PV technology. 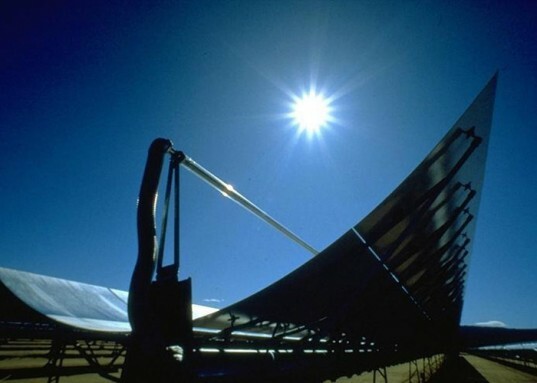 Here at Inhabitat, we have covered multiple solar power plants in the area. With the inclusion of the Desert Sunlight Solar Farm, the region will have a combined solar capacity of 354 megawatts (MW), making it the largest solar power installation in the world. Nevada’s Solar One is a solar thermal plant with a 64 MW generating capacity, located near Boulder City, Nevada. However this all pales in comparision to the forthcoming Blythe Solar Power Project – a 968 MW solar thermal power station under construction in Riverside County, California. 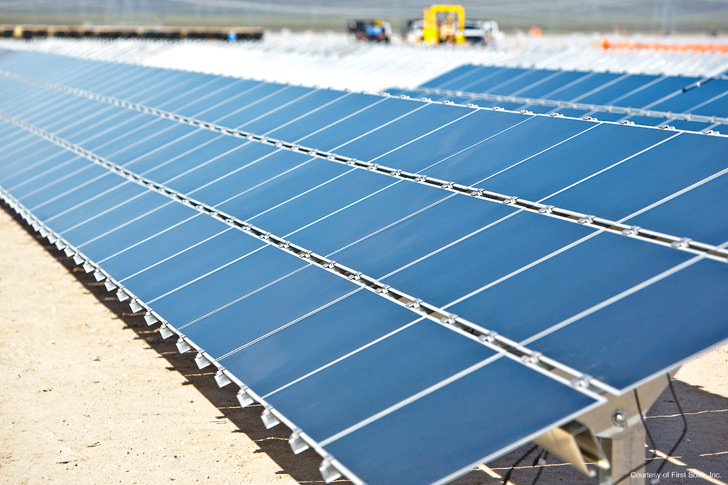 The Riverside Press Enterprise reported on Apr 17th, 2015, that Desert Sunlight used 8,000,000 panels to produce 1 million megawatt-hrs. That's 125 kwh per panel per year. At 14 cents per kwh, it means each panel only returned $17.50 worth of electricity annually. Given that each panel is specially mounted and requires constant cleaning, maintenance and repair - that would easily drive the cost to over $500 during the expected 10 year life span. At $17.50/yr. ROI, this is a horrible investment. This is the destiny of the solar power industry, perhaps even federal land grabs. Your gonna need thousands of square miles of desert that no one cares about to generate sufficient power for metropolitan areas. On 4100 acres to generate a miniscule 550 megawatts of power. That's over 7.4 acres per megawatt. You would need over 17,000 acres of land to compensate for the power output of San Onofre Nuclear power plant plus over 16,000 more to replace Diablo Canyon. There were previous uproars about building a solar farm in the desert in regards to disrupting the habitat of a desert tortoise. Nuclear power can even be used to desalinate huge volumes of ocean water to water scarce regions of southern California or even piped inland to cities like Vegas or Phoenix. The Golden State is about to get one hell of a solar boost, as Secretary of the Interior Ken Salazar just gave the green light for the construction of the Desert Sunlight Solar Farm - a 550 megawatt solar power project that will be built in the California desert east of Palm Springs. The photovoltaic solar facility will generate enough energy to power 165,000 homes while bolstering the local economy by creating more than 630 jobs during its construction. The plant will use state-of-the-art ultra-thin photovoltaic (PV) technology to generate electricity with low visual impact and no air emissions, waste production or water use. In fact, it is expected to have the smallest carbon footprint of any PV technology.